It is an unmistakable sign of the corrosion of Indian democracy that an odd combination of illusions and nauseating bravado is being spun in Delhi around the grim political situation in Kashmir. Every element of Indian policy in Kashmir lies in tatters. And yet, instead of asking forthright questions, our denial goes deeper. Kashmir now seems to be going from a deep and violent conflict to a state where there seems to be a death wish all around: Security forces with no means to restore order other than by inflicting death, Indian nationalism now more interested in showing machismo than solving real problems, increasingly radicalised militancy with almost a touch of apocalyptic disregard for life, foreign powers fishing in troubled waters, scores of young men and children even, who are making a statement that courting death seems a better option than what they regard as suffocating oppression. They are all feeding off each other. The roots of the Kashmir problem are deep, and the point should not be to gloat at one government’s failure. The deep gulf between what the Indian state wants and what Kashmiris in the Valley want has always been unbridgeable. But over the last decade and a half, beginning with Vajpayee, there was an attempt to create at least some kind of modus vivendi that had three elements: Containing insurgency, relying on local political forces and elections to at least create partial modes of incorporation, and reaching out under some nebulous appeal to “insaniyat” or humanity. What has transpired in the last few months has made it clear that every shred of Indian policy is now ineffective even to produce a modicum of a modus vivendi in Kashmir. Whatever our counter-insurgency, or counter-militancy policy is, it is backfiring profoundly: Kashmir is more in the grip of militancy and radicalisation than at any point in the last 15 years. Whatever our hope that some modicum of local democratic process can create a sense of participation has been belied by the single-digit turnout in the Srinagar by-polls: A stinging rebuke to faith in Indian democracy. Admittedly, the fear of violence and threats by militants contributed to this stunning debacle. Let us for a moment assume that it is just the threat of violence that kept people away. But isn’t that supposed to be the point? Why, after three years of this government’s strategy, are we less able to protect Kashmiri voters? What does that say of our counter-insurgency strategy? It’s a fool’s errand to think that coercion alone will win India Kashmir. But more deeply worrying is the fact that the legitimacy of almost all conventional political actors on whom we have relied, from the PDP to the National Conference, is dipping rather than increasing. Their hold was always very tenuous. But it should be obvious now that they are not even remotely plausible instruments of placating Kashmiris. What other political interlocution will there be? And there is no space left for a dialogue outside of the realm of politics, a dialogue that can address the almost unbearable suffering this conflict has produced. We have regressed to a new and, even by Kashmir’s standards, a frightening low, in Kashmir, pure and simple. But the disquieting thing is that no one in Delhi wants to face this truth squarely. The Indian emperor has no clothes. I am trying to imagine what the headlines would have been on Kashmir five years ago. This column was often critical of Manmohan Singh. But on Kashmir and Pakistan, he was wise, and it is a pity that we frittered away a slender historical opportunity to make progress on Kashmir. Yet, I can imagine, if the current catastrophe we are seeing in Kashmir had occurred under the UPA, Manmohan Singh would have been roasted and held to account. But we dare not say the truth that, for the moment, Kashmir has been lost on Modi’s watch. The point is not to apportion blame. Maybe there is an overdetermined futility about Kashmir. But we are doing ourselves a disservice by engaging in a politics of diversion. More than militant propaganda, the way we talk about Kashmir does more harm to India’s cause in Kashmir which desperately requires breaking the cycle of othering and humiliation that has marked this conflict. It creates difficulty even when groups in the Valley do this. But it is inexcusable when those more distant wage their bravado wars of revenge to perpetuate this cycle, as if we were not talking about fellow citizens. We do this by making territory efface all considerations of the people: The militants did this by forcing out Pandits; but we risk doing the same by not recognising the core issue is not holding territory, it is giving people confidence in the Indian project. Second, we are gullible enough to buy diversionary tactics. At the height of this unfolding catastrophe, what was most of Delhi discussing: Were some stone pelters paid to throw stones? 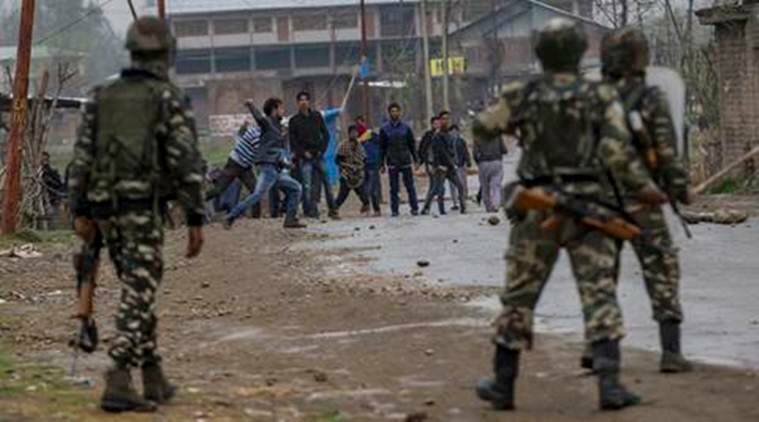 The faux outrage at what might be true of some stone pelters completely obscured the larger question of why our Kashmir strategy is a failure, pushing us to new lows. Our discourse on Kashmir is enough to convince anyone that if the Indian state needs this much propaganda and diversion to convince people in Delhi not to ask hard questions, it must surely mean that it has lost the plot. Even our jawans will be better served if, instead of fantasies of revenge, we asked hard questions about why we have put them in this situation in the first place. But treating a serious situation as a farce does not do our credibility any good. The quality of Indian democracy may not be sufficient to enable an opening in Kashmir. But surely it is a necessary condition. It is difficult to shake off the sense that as Indian politics continues on its pathway of jeopardising individual liberty, and finding proxies for targeting minorities, whatever toehold Indian democracy hopes to have in Kashmir will erode even further. There is a long and arduous summer ahead. The international environment is turning against India: China is more aggressive; our obsessive desire to get aligned with the American military industrial complex will not yield dividends on Pakistan. In short, Pakistan’s strategic space has increased, not decreased. But we are looking at a situation where our strategy of containment by force has failed, our political instruments are hollow, and there is a deepening death wish in the state. Kashmir is looking at an abyss. Who lost the plot this time around?